Home News Local Is Old Bossier redevelopment bad for business? Is Old Bossier redevelopment bad for business? The storefront of Bayou Belle antique store at the corner of Barksdale Boulevard and Arcadia Street. The store is one of several that has been impacted by the closure of the main thoroughfare for a major area overhaul. 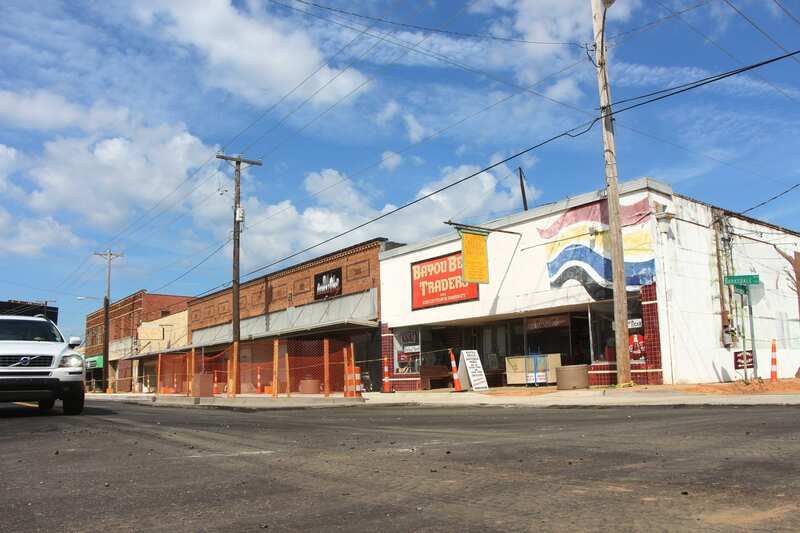 While the upgrade of Barksdale Boulevard, as part of the redevelopment of Old Bossier, promises great things for the future, some current tenants are wondering how to survive in the short term. Over the next year or so, $12.5 million worth of improvements will be made to roads and buildings along Barksdale Boulevard from Traffic Street to Hamilton Road as part of a redevelopment. Work started in June to transform the historic downtown into a live/work/play area with closure of Barksdale Boulevard and work beginning on the first two blocks from Traffic Street to Arcadia Street, eventually making its way to Hamilton Road. That’s when business changed dramatically for store owner Beth Carr. She and her husband purchased the Bayou Belle antique store at the corner of Barksdale and Arcadia Street a year ago. The section from Traffic Street to Arcadia Street was the first to reopen. However, Carr has yet to see an increase in foot traffic through the business. Carr is hosting a book signing in her store Friday, Oct. 14, from 1 p.m. to 3 p.m. to hopefully bring people back to downtown. Author Linda Swain Bethea will be on site with her book, “Everything Smells Just Like Poke Salad.” Illustrator Kathleen Holdaway Swain will also be there. Copies of the book will be available for purchase. If this event is successful, Carr said she would consider hosting other events at her store. Carr plans to stay open until she just can’t afford to anymore. She hopes business will pickup again soon. “I know it will be wonderful once it’s finished, but the question now is can we hang on to see it finished,” Carr said. The next section of Barksdale Blvd. is slated to open the first week of November, which will run from Arcadia Street to Mansfield Street. Expected completion date for the entire roadway is May 2017. Downtown Bossier, or Old Bossier, will not only see a major infrastructure overhaul, but has been renamed the “East Bank District.” The area is currently undergoing a complete overhaul that will see it transform into a hub of live/work/play space aimed at not only attracting visitors, but newer, younger families and workforce to the city. The key aspect of the project is a central plaza from Arcadia Street to Monroe Street that will provide a community gathering space for concerts, fairs, farmers’ markets and other events. To go along with this is a commercial incubator building with two floors of commercial and retail space and another two floors for office space. One block behind the plaza will be a mixed-use building that will have residential apartments above first-floor commercial space. This area will use a mix of existing and new buildings to create a commercial, residential and entertainment centerpiece for Bossier City.